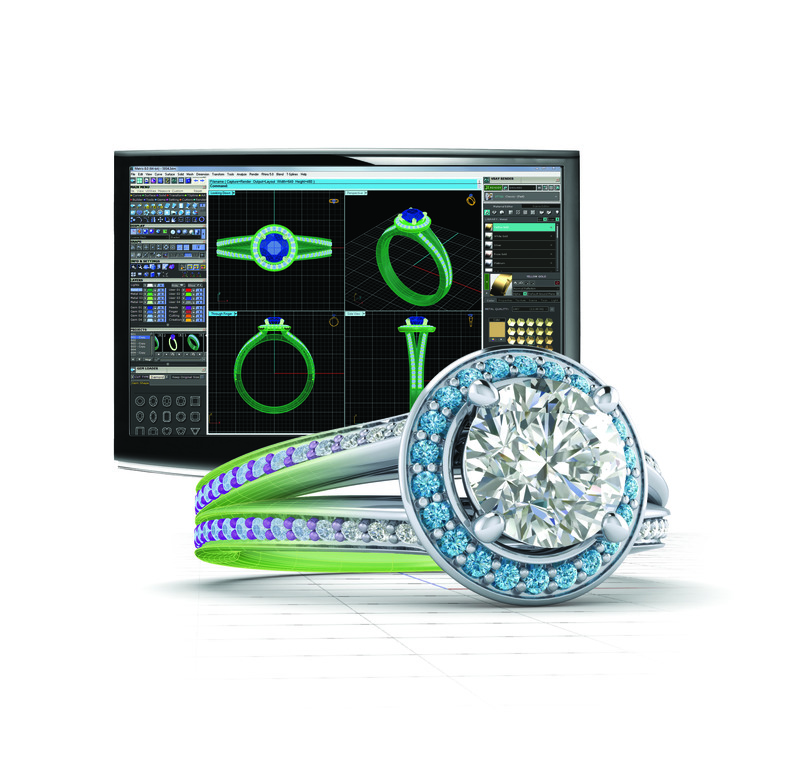 Created for jewelers by jewelers, Matrix is the most innovative jewelry design software for jewelry professionals. Harnessing the power of Rhino along with a jeweler-friendly interface, Matrix empowers you to design beautiful virtual 3D jewelry in a fraction of the time. Then output your file and make your design a reality. Whether you are a retailer or a manufacturer, the tools within Matrix streamline the process of selling, designing, pricing, manufacturing and marketing jewelry. With its headquarters in the United States and a global network of Authorized Dealers, Gemvision develops the best-in-class CAD technologies. More than just a ssoftware provider, Gemvision is the total business solution with product training and exceptional technical support. Since its founding over 20 years ago by a retail jeweler, Gemvision has always been a company of jewelers helping other jewelers use technology to express their creativity and enhance their bottom line. At Gemvision, innovation is our tradition. Matrix is not a toy like Age of Empires that needs to be tried out before you buy. It is a very complex and powerfull tool that is changing the jewelry industry. A demo would be usless unless you spent the time to realy learn the interface. When I think of Matrix and its many advantages, I just have to look at all of the jewelry design competitions that are being dominated by users of Gemvisions Matrix. Sounds like vapourware. No demo or detailed info. I think, if they are not able to build a working-demo, how can they make an absolute perfect tool? I can`t believe the 5-Stars reviews as long as there is no serious demoversion available. $5000.00 US is a little bit much for a Plugin, if You cannot be sure that it is useful. People whine about the fact, that there is no demo for it, but i think they didn't sat down to think. A demo is only a demo, the true potential of the program will never be available in a demo. I am using Matrix for more then a month now, and i am discovering new combination of procedures every day. For a program this complex they better don't make a demo, because when people try it, they'll say: 'Ok...and that's all?' . Whit this program, only your imagination and skills are the limit. ps: demo is for games! programs have trails, which is a totally different thing. This is no longer an issue about Rhino's proprietary platform, as Rhinogold and Rhinojewel provide free 30 day demo's with full consent of Rhino 3D. If you expect people to invest $6,800! before they purchase your programme, they also require the time and critical analysis to make such a purchase. I agree, our experience with your Customer Service has been exemplary. However asking questions and receiving video's is one thing, and being able to try the software is another. To consider Matrix a plug-in is only a technical term. When you have a program that has dozens of plug-ins - it’s a program. Matrix is a powerful tool, catering specifically to the jewelry trade for effective design and modeling. It has taken Rhino into a new dimension. The software is carefully planned out and made to handle tasks that would otherwise require hundreds of button clicks - let alone knowledge. It is neatly flooded with builders that handle everything needed to make finished jewelry. The program takes you from concept to Finish - with applications to check for structural (modeling) integrity, weight estimates and rendering. The upcoming new version (I'm a beta user) 2.0 has features that I did not expect to see. They listen to their clients and apply the needs of the designer into the software. Matrix is designed to take you from concept to finish. One might say that if I can't test it is not worth it. I say if it's free it’s probably not worth while. BTW: you can get a one on one online demo from these guys. Now, what’s a better way of experiencing the product and the support that GemVision offer? It's definately worth it's weight in gold. Después de trabajar con Matrix 3 años , me case de que no soportada las violaciones de las superficies y con fallos muy caprichosos de boleanas , tenia que ser muy estricto en la instrucción , me pasaba mas tiempo reparando la superficies que construyendo , al final opte por comprar 3 Designjewell me soluciono muchos problemas de Matrix .hoy en día convino los dos programas ,pero el parametrico de 3Design es una gran ayuda para desarrollar piezas de joyería sin ningún problema . Having designed jewelry for the last 30 years, I know exactly how I want my tools to serve me. Matrix does exactly that - I visualize the final piece in my head and render it in Matrix just as I might create the item in wax or fabricate it in metal. The beauty is that Jeff and associates have anticipated all the bells and whistles I need to get the job done, and output an awesome finished image as well. If you are serious about jewelry design, stop complaining about not having a demo - there is way too much here for a demo to ever communicate! Go to a trade show or arrange a presentation in your store. Matrix owners are unanimous in their 5-star opinions of this sofware - it's the whiners who haven't experienced it that are the losers. As far as my future in jewelry design...I will never pick up a pencil again. sorry guys come out with a free download demo now and show what you have got - then let us decide if your software is a winner and your price asking is a steal! Matrix is not designed to replace Rhino, it is an enhancer. It is true that MOST things you could do with matrix could be done with just rhino, but in a much greater time frame. Gemvision has created a wonderful product. For those who are doubtful because there is no demo, you can do online video demos. But lets be real those who dominate the world of custom jewelery designs use Matrix. It is unbeaten. And each generation of the program far surpasses the last, and all competitors for that matter. This makes all aspects of jewelery design easy and productive. We make Hundreds of custom designs a year with Matrix, and would not go with any other product. Se vuoi disegnare gioielli ad alti livelli ed in poco tempo, non puoi fare a meno di acquistarlo come ho fatto io. L'unico difetto di questo plug-in e' il prezzo....altissimo... ma per il resto non c'e' nulla da dire. E' stata studiata l'esigenza del settore orafo nei minimi particolari. E come c'era scritto in un precedente messaggio, sotto alcuni aspetti sembra veramente fantascienza. After all these reviews about 'no demo' there is 'still no demo'. I have been a beta user of Matrix since 2001. It is one robust plug in. The user interface is intuitive and easy to get around in. There are so many features that it does take commitment of time to master. I told my staff I am working on the computer from this day forward. That was two years ago and I learn more everyday. I have been designing jewelry for thirty years and this is the most exciting thing that has happened to jewelry design in that time. The renderings sell pieces faster than we can produce them. Good training, a great manual (digital and paper), and a staff that always helps, makes this program the single best technology investment I have ever made. Matrix is helping to change an industry, just ask the Gemological Institute of America where it is being taught as of 2002. If you have the time to dedicate to using this CAD/CAM software it will give you a whole new set of tools. Yes, Rhino3D is very powerful software, but without Matrix, it is too general. The fact that it can build a ring and it can build a boat mean the tools have to be very general. Matrix is designed with the jewelry designer/benchie in mind and is essentially a completely separate program, using Rhino3D as the engine to power Matrix' sophisticated tools. I've been on both sides of the fence, and I would never go back to Rhino only. Plus their support/forums are best in class! This program ROCKS! To call it simply a plugin is a diservice. The guys at Gemvision have put together a wonderful product that would be worth twice the price. Jewelry is made with the greatest of ease and your client is able to see the design from any angle they could want. I made my money back on this product in a weeks period of time after training and the support is second to none. For those crying about no demos, contact the company and setup an online demo. There is no way you could try to fumble on your own to run this incredible program. Thanks buddy, I have to say that the guys out at GemVision are some of the best in the business, they are always working very hard at providing products that work in real life retail situations and on top of that they are constantly trying to remove bugs, listen to others about their system,upgrade the software and are still always happy to help when you call. I don't get paid to say this but I'm sure that other users of the fine GV products can testify that GV is in a class by itself. Please forgive my enthusiasm (especially all the other great 3d programs out there)but my business is GV products and without their products (that we use everyday)I would not be able to take my concept in this direction,thanks guys, tell Jeff that the drinks are on me. Use it wisely, and you will not be able to calculate the real value Matrix brings to you. Matrix is for serious jewellers & designers ONLY. The cost of the software is high but is affordable for jewellers who take advantage of CADCAM to maximize their biz. It is a shame that the person who keeps whinning in this review column did not have the brain to secure a gold mine with Matrix. He is too busy changing names logging in and out to give low review ratings. Yes it is definitely one person's work and he definitely did not sound wise. If this software is too expensive, or is so difficult to get access to, then just stay away. Really, no one cares. However, those one-man 'no demo' shites brought about quite an amount of stories containing good uses of Matrix. For me, my design team has 5 liscenses of Matrix, 3 artcam, 3 cnc stations, and one thermojet from 3D systems. on average we produce 10-15 models a day, and that is much LESS than we can actually do. We simply have more capacity than the demands from our current mix of clients. Matrix is that if you use it in right way, which is certainly no more difficult than other CADs, then it translates to high productivity (individual's output), high quality (photo-realistic rendering), and much lowered cost (no more handcrafting model scratch from a chunk of metal or wax). And these above-mentioned qualities are essentially what you need to be successful in today's competitive jewelry industry. Plus, the 'quantity-quality-cost down' ability of Matrix is UNMATCHED by other similarly priced jewelry design software. Lastly, it's file output can be fast-prototyped in CAM with extreme precision and stability. Try the $3995 JewelCAD and you will find out why Matrix is superior in mucho ways. The Rhino platform is the foundation for the only intelligent solution for the jeweler interested in CAD today. The professionalism and thoroghness of Gemvision is at it's best in the Matrix front end for Rhino3D. I spent four years teaching rhino to my students and all the time lusted after the Gemvision front end. My investment in their other products provided me with the confidence needed to make a capital expenditure that is by far the smartest investment I have made in the jewelry business. I cant say enough about the expert training and support, and the friends that I have made at Gemvision. You will not find a better solution dollar for dollar. email me with your questions, I would be proud to help you and Gemvision! Would you buy a $5,000 car without driving it? Would you by ANYTHING for $5000 because typewritten messages from no later than a year ago said you should? There's a message with a page for tutorials - try it, it's dead. I am extremely, totally absolutely wary of people who hide. Spammers hide. I know Matrix is not spam, because I know someone who uses it. However, I'm not going to fly across the country to try your software, I'm not going to buy it sight unseen, I'm just not going to buy it, period. People are not stupid, don't treat them like they are. You'd sell 10 times as much if you'd price it for it's value is, and put the product on the market like everybody else in the world. Matrix Version 5.3.1 is now out. For jewelery design, Matrix takes the power of Rhino and magnifies it. Gemvision has extended the capabilities of Rhino to speed and simplify stone layout, Height field from bitmap control, prong, bezel, pave, head and channel placement and control. Interactive controls speed creation times. This is a powerful tool that anyone designing jewelry using Rhino should consider. I am 4th generation jeweler, BSc. in Electro-Mechanical engineering, MSc. in Computer science, MSc. in Internet technologies and few other diplomas in Web development and Design The average person spends few seconds browsing web pages and of course more if you find something interesting to read or finding what you are looking for. If I am looking to buy this software, I'd like to go their website, read about the company, the product and try to find some reviews, and of course I'd like to try it out first, if I decide to buy the software, I'd like to click on the buy the product now, pay with my credit card and either download the product or have shipped to me. As simple as that, no hassle, no sales people and now time wasting. I was really very much interested in buying the software but after searching their website and few others I couldn't find any prices, or direct links to where I can buy the software. I don't need a sales person to tell me what I am buying and for sure I don't have the luxury of time to waste with a sales person blithering for hours about how good the software is. I'd understand if the company worry about making a demo for people to try, but what I don't understand is why don't they sell their products directly from their website or at least state the cost. Almost all of the reviews here sounds like they were written by the company itself or someone been paid by the company to write them ( no offense to anyone ) ( I said almost – this mean not all ) Everyone talks about how good their support is, what the hell are you talking about. Support for what???? How to install the software or how to use the computer or what.. If you need support on how to use the software then you shouldn't be buying it My final verdict >> bye bye Matrix, I'd rather buy from a company that don't hide behind their sales people and for sure from a company who tell people how much their software cost. This company although might have a good product but they sound like a life insurance company who can only sell their products through sales people. No demo no SALE! Would you buy a $5,000 car without driving it? You can save TIME and MONEY, ..and even GOLD using Smart3d StoneSetting: it's faster, easyer, and cheaper. The StoneSetting software allows you to make the basic and most important fonctions to set the stones correctly. Do you need more? ...then try with a good specilized training course. there is no demo, so there is no chance to see how good it could be. maybe they sholud follow the 'rhinoceros' trend. no demo no sale. Matrix stop with the fake reviews all with 5 stars. Once you know your ways around Rhino and Grasshopper you'll never consider ANY packages that actually, unless you know Rhino inside-out, weakens your skills by using several automatons built in, called builders etc., and force you in thinking by the restrictions of the programs on HOW it can do the job. Never mind the lack of total control achieved only by using Rhino in a free environment. Yes, you can still use Rhino at will at anytime from within Matrix but you are not going to, because most of the Matrix user never really got to an advanced level in Rhino otherwise they would.... well, read the above statement. Save your money, get on with Grasshopper and experience sheer power. I'm working at Beverly Hill Jewelers Mfg. and proficient with Matrix VI.Recently our boss upgraded software for seventh version and soon I understood that Matrix crew just decided to earn some extra money with minimal efforts. Instead of improving multiple annoying features, they just added many unnecessary new V-ray tools. For example: when modeller uses 'Gem on curve' tool, he/she is forced to change five default settings every time he/she wants to use that tool. If you want to use it multiple times in row this disadvantage becomes a huge annoying headache and significantly slows down the working process. So on, so on. All that new V-ray features maybe are good, but for artisans they are less important than having fast and properly working tools. Matrix is a nice looking plug-in, but Just with one week of rhino lessons you won’t need matrix. Rhino has all the tools you need and more to build any jewelry model. In my opinion, Rhinoceros Matrix 3D ( version 6.0 or 7.0 ) is a great program for CAD CAM jewelry designers.. I used to try another 3D jewelry programs before, but so many weakness there.. Matrix is the most accurate program to make a perfect model & rendering.. I'm a jewelry designer in a jewelry manufacturing, so I'm using Matrix because it's very compatible with 3D printing machines like Solidscape, Revo or 3D System..
By far the best jewelry design software on the market. It’s Rhino on steroids for the jewelry industry. The builders have increased my productivity 400%. The tech support is beyond any that I’ve seen. With 6 years experience in cad design, and injection molding for the jewelry industry my advice BUY MATRIX NOW. I just have to respond by saying I have seen these Matrix guys at trade shows for years now. Their program is up and running on several computers and you are welcome to sit and play for as long as you want. Agreed a demo would be helpful but not having one does not preclude it from being a very useful and time saving program. If you are in the jewelry business certainly you attend trade shows and certainly you could explore this software at the major trade shows. If you are not in the jewelry business hmmm, why buy it? Just get rhino for 1/10 the price. The bottom line is the program was worth the 5k, the support is top notch and I hope you don't buy it... more competition. First how can somebody rate this program a '0' when they never tried it. All they do is complain there is no demo. I used the program at a trade show for as long as I wanted to, then I bought it. THE GOOD NEWS: The plug-in is very well thought out for a person who wants to make jewelry. It has a great library of profiles, rails, stones and more and more and more. If you want to dive in and create jewelry it is definately worth the money. I have had it for about 1 year and I am completely satisfied with the programs stability and fuctionality. The tech support is very helpful and they are not 'dry' when they talk. Call or email support questions have been answered quickly. They did all the work so I could just make jewelry and sell it. I have made over 350 models with it. Definatley paid for itself. THE BAD NEWS: If you want to spend a year learning Rhino before being able to make jewelry then don't buy this. It is a slight crutch and thus prevented me from learning the more advance features of rhino. But guess what? I crank out the jewelry, that was my goal. With out a doubt the best jewelry software in the world. I'm naming my first born after Kent at Gemvisions Tech support. As others have posted; you are buying into the company. This is key. The products are fabulous but if support isn't available it is useless. I have called so many times for help and not once, in all my calls, have i ever felt as though i was a bother to them. Everyone is courteous, kind and helpful (not to mention, patient).The product takes a bit of learning (although my 16 year old son took to it like a fish to water) but it is extremely well worth it. I've been a goldsmith for 26 years and this is the best new product i've seen and have been excited about. Gemvision is very responsive to all of our ideas, suggestions and concerns. The bottom line is that the people of Gemvision are the best and their product outperforms the rest of the competition. I am not a jewelry designer. I am just a computer nerd who is trying to help a friend. He suffers from computerfobia and asked me if I can help him with jewelry design software evaluation. He heard about matrix, so I started to investigate. Found nothing useful besides the sells pitches. Problem is that I know his abilities and I have to know if he will be able to use this software. He will never talk to matrix people himself. Neither will I, unless I can try it myself. So in this case - no sale without evaluation. It may be not appropriate for him for many different reasons, no matter how good this software can be. So far he's doing fine making things by hand. The reason I like this program it is very friendly. They go very deep in jewelry speciation. The people being not jewelry’s knowing all these details. I'm sure they spent a lot of time with professional jewelry’s. Some people complain about the price only matrix arts prove the price is very reasonable, because if go to other plug-in from Rhino only that part of it program they selling for a thousand dollars. I've been a jeweler for thirty years and have been doing CAD for ten years. I have used Solidworks, Rhino and Matrix. For the commercial jeweler there is no substitute for Matrix. The speed and flexibility Matrix offers the jeweler is unmatched by any other generic or jewelry-specific program. The support is personal, honest and speedy. It seems almost all of the negatives in these reviews are from people who haven't used Matrix, and/or are angry that they can't get a demo copy. Go to a trade show---stand at the Matrix booth for a few hours and try it. You'll find it extraordinary. But don't write a negative review because you can't get a freebie. This is an excellent product produced by talented, hard-working, innovative people. I have read the reviews complaining about 'no demo'. I would be surprised if the ones that complained about not having a demo are in the business of, working in a modern fast paced jewelry store, or manufacturing company. I mean no disrespect here, but if you are in the Jewelry Trade and in the business of custom jewelry or designing jewelry and/or manufacturing I find it very hard to believe that you have not been to the NY, or Las Vegas Trade show. If you go to a trade show you can take a test drive on Matrix at the Gem Vision Booth. The staff of Gem Vision is always willing and able to help you at their booth. By exploring the program with a staff member you are not obligated to make a purchase. In 30 minutes with a trained staff member you can see enough of the program to realize if it is right for you and your business or not. To knock Matrix for not having a 'Demo' is a pretty poor argument in my opinion. If you are not able to attend a Jewelry Trade Show and see the software in action for yourself given the potential benefit to you and your company, perhaps you should stay with just the free demo cad programs that are out there. Others have stated that Matrix is not a toy, it is for a serious jewelry industry user. On top of that the high level of support you get from Gem Vision is second to none.